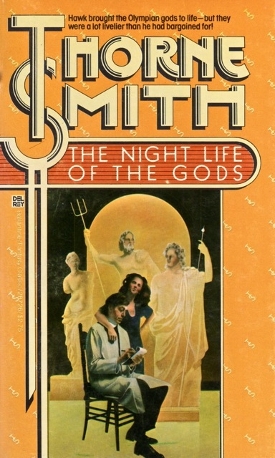 Unconventional is too timid a word for Thorne Smith’s 1931 novel, The Night Life of the Gods. In it Smith violates quite a few supposed rules of storytelling. The protagonist is not particularly likable, there is not much in the way of coherent plot, a considerable amount of the action ranges from implausible to outright impossible, and it has the sort of ending that Hollywood executives would have vetoed. On top of all that, what goes on in the book flies directly in the face of proper moral and civil behavior both then and now. So why was it so popular at the time? And more importantly, is it still funny and worth reading today? 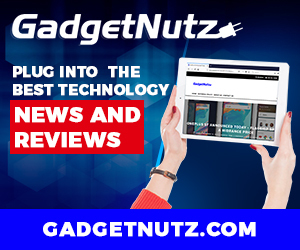 The story follows Hunter Hawk, an independently wealthy, loner scientist content with periodically blowing himself up in the privacy of his laboratory. Unfortunately, his sister and related in-laws are living off his good graces yet have the gall to disapprove of the way he conducts his life. After a particularly jarring laboratory explosion, the relatives go searching for Hawk’s body in the wreckage, and not finding it, greedily begin discussing their inheritance and how they will redecorate now that he is gone. He is, in fact, dangling from the rafters and hears every word and can barely contain his anger. With the help of his niece Daphne, the only one of the lot that he actually likes, he descends from the rafters to find that his experiment had been a success. He has achieved “Cellular petrification through atomic combustion.” In other words, he can turn living things to stone and back again. This is about as scientific as the story gets, which is to say that it isn’t really. But it is decidedly fantastic as will become apparent. To get some peace for the first time in years, he turns his undesirable relatives to stone and goes on a drinking binge. Drunkenly wandering through a corn field he encounters a leprechaun with whom he shares his wine. He is then introduced to the leprechaun’s daughter, Meg or Megaera (named after her ancestor, one of the Greek Furies), who is tall for one of the Little People. She takes a liking to Hawk and teaches him a trick of her own, how to turn statues into people and back again. From then on, Hawk and Meg are inseparable co-conspirators in a series of mischievous activities, including bringing to life eight statues of Greek and Roman gods and goddesses from New York’s Metropolitan Museum. The bulk of the novel is a tale of alcohol, sexual innuendo, thievery, and other irresponsible merriment. So what made Smith’s novels so appealing? Firstly, he had an exceptional talent for witty dialog. He was often compared to P. G. Wodehouse and it is not an entirely unfitting comparison. If you’ve never read any of Smith’s work, you may have been exposed to his writing via his novels that were made into movies, most notable of which was the 1937 hit Topper staring Cary Grant and Constance Bennett (which Smith never lived to see due to an untimely death at age 42). His stories and dialog represented the embodiment of 1930s screwball comedy. If you are familiar with that genre, you know that silliness reigns supreme. And that is what you get in a Thorne Smith novel, whether it be Roman gods walking out of the Metropolitan, alcoholic ghosts (Topper), an experiment that renders a man invisible with the exception of his bones (Skin and Bones), or a man and wife magically trading bodies (Turnabout). Contributing to Smith’s popularity were Prohibition and the Great Depression. There is a significant amount of alcohol consumption in nearly every Thorne Smith novel. And by the time The Night Life of the Gods came out, the majority of Americans had had enough of the Volstead Act. The book not only showed distain for prohibition, but also for what he called “White-collar sinners,” upper class hypocrites whose parties produced an “inferior grade of sin” and behavior for which the lower classes would get arrested. At this point, Americans were at the tail end of decades of overzealous Progressive social engineering, and Smith’s Hunter Hawk was rebelling against the lot of it by breaking all the rules. All that is well and good as a history lesson, but where does it leave the modern reader out looking for good humorous SF/F? It depends. For some, Smith’s style will come across as dated, Hawk will seem mean-spirited, and no doubt some will take issue with the morality, or lack thereof, of the primary characters. On the other hand, there is no question that Smith crafted some very witty dialog. 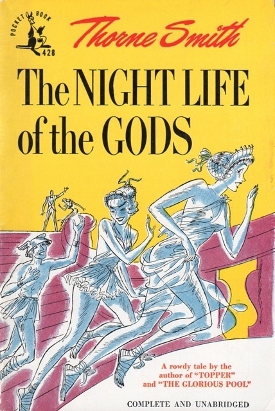 Fans of 1930s screwball comedy will find The Night Life of the Gods to be a delight prompting further investigation into his other novels.